Venezuela’s President Nicolás Maduro has dismissed calls for new presidential elections amid fresh protests against his leadership. In a show of defiance, he insisted his victory in polls last spring had been legitimate. Opposition leader Juan Guaidó declared himself interim president last week, prompting an escalating power struggle. In an interview with a Russian news agency, Mr Maduro said he was prepared to hold talks with the opposition. “I am ready to sit down at the negotiating table with the opposition so that we could talk for the good of Venezuela,” he told Russian news agency RIA in Caracas. Mr Maduro said that if the US and others wanted a fresh vote, they would have to wait until 2025, but added that he would support early parliamentary elections as “a good form of political discussion”. He added that he was not prepared to accept ultimatums or blackmail, and insisted that he has the backing of Venezuela’s military, and accused deserters of conspiring to plot a coup. “Military deserters have become mercenaries of the Colombian oligarchy and conspire from Colombia to divide the armed forces,” he said, without providing further details. His comments came as new protests called by Mr Guaidó began. The opposition leader, who is head of Venezuela’s National Assembly, says the constitution allows him to assume power temporarily when the president is deemed illegitimate. How does the world see the crisis? The US and more than 20 other nations have backed Mr Guaidó. The White House said on Wednesday that he and President Trump had agreed to maintain regular communication to “support Venezuela’s path back to stability”. Venezuela’s Supreme Court has banned Mr Guaidó from leaving the country, however, and frozen his bank accounts. Mr Maduro has the backing of Russia, China, Mexico and Turkey. US officials have previously stated that all options “are on the table” to resolve the crisis in Venezuela, which observers have taken to include possible military action. 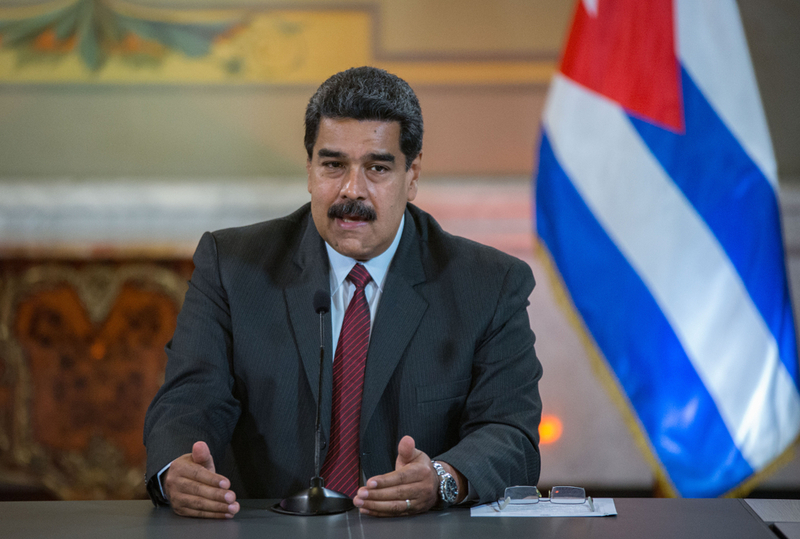 Curbs were imposed on the country’s state-owned oil firm PDVSA on Monday, which US National Security Adviser John Bolton said was to ensure that President Maduro could “no longer loot the assets of the Venezuelan people”. Mr Bolton also appeared at a news briefing with a notepad showing the words “5,000 troops to Colombia” – which borders Venezuela. Why is there opposition to President Maduro? Venezuela is facing acute economic problems and there has been an upsurge in violence in recent weeks.